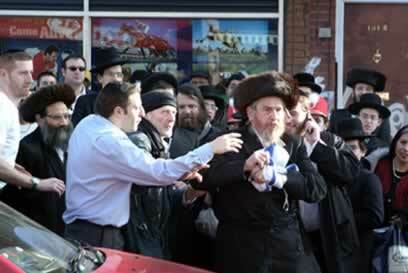 On the afternoon of the Jewish holiday of Purim March 18, 2003 in London, England, a group of Orthodox Jews opposed to Zionism assembled to display their opposition to Zionism by burning a flag of the Zionist State. Unfortunately, before they even had the opportunity to burn the flag, they were approached by dozens of Zionists who proceeded to scream, yell and curse the valiant anti-Zionist Orthodox Jews. There were attempts on the part of the Zionists to employ violence against the anti-Zionists, and at least one of the Orthodox Anti-Zionists was injured. The British police were alerted to the situation and moved in to protect the peaceful anti-Zionist protestors, taking them away from the site before they had the opportunity to burn the Zionist flag. The following night the synagogue of Neturei Karta in London was vandalized with Zionist stars of David being painted all over the synagogue - a tactic used on occasion against the synagogue located in New York as well. Of course Orthodox anti-Zionist Jews will never be deterred in their protests against the vile anti-Jewish Zionist regime. The expressions of opposition to the Zionist Regime are a mighty sanctification of the Name of G-d, and serve to counter the overwhelming desecration of G-d’s Name and the Jewish religion undertaken by the Zionist Regime in Palestine and its supporters. It should be noted that anti-Zionist Jews are subject to merciless intimidation through regular Zionist media sources and community organizations in an atmosphere over the past two years of extreme hysteria. Therefore it is not at all surprising that there are not larger numbers of participants. 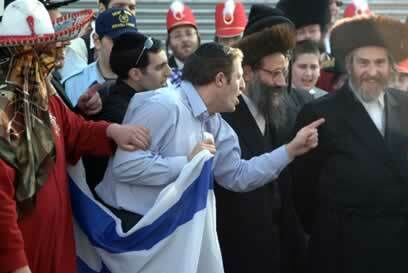 Cops had to keep rival Orthodox Jewish groups apart as a symbolic burning of the Israeli flag in Stamford Hill's Hasidic community threatened to turn violent on Tuesday afternoon. Police stepped in before the flag could be burned by supporters of Neturei Karta International, a religious organization opposes to the Zionist political movement which established Israel as a national homeland for Jews. 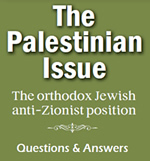 True Judaism doesn't accept a Zionist state, which is a political idea and contrary to the teachings of the Torah," said Rabbi Abraham Grohman. 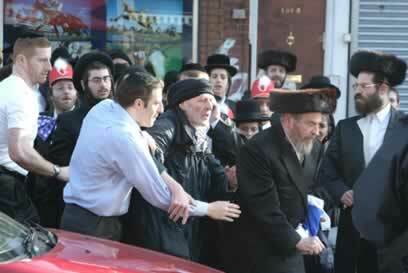 He and other anti-Zionists were escorted away by police for their own safety as a 100-strong crowd, some of them in fancy dress costumes to celebrate the Jewish religious festival of Purim, gathered in Donsmure Road.